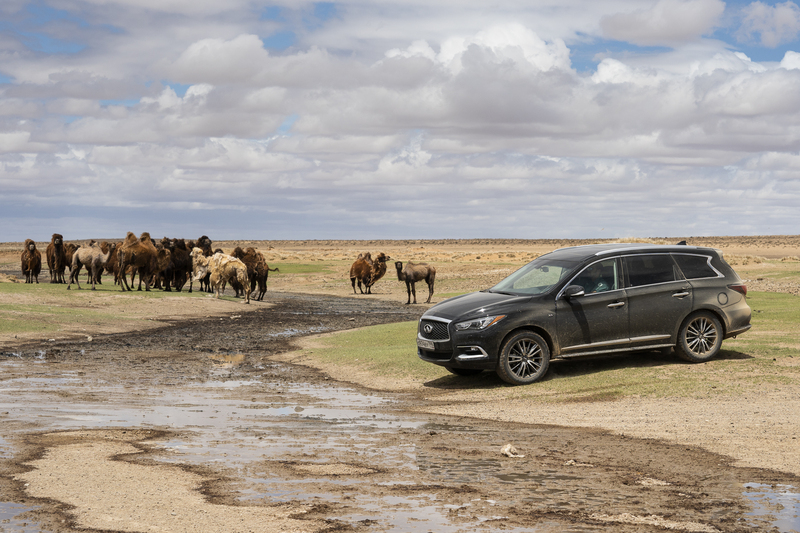 There are few roads in the southern Mongolia steppes—the flat grasslands woven in among the dunes and rocky hollows of the Gobi Desert. You simply drive in the direction you want to go, and if there happens to be a trail worn by previous travelers, fantastic. 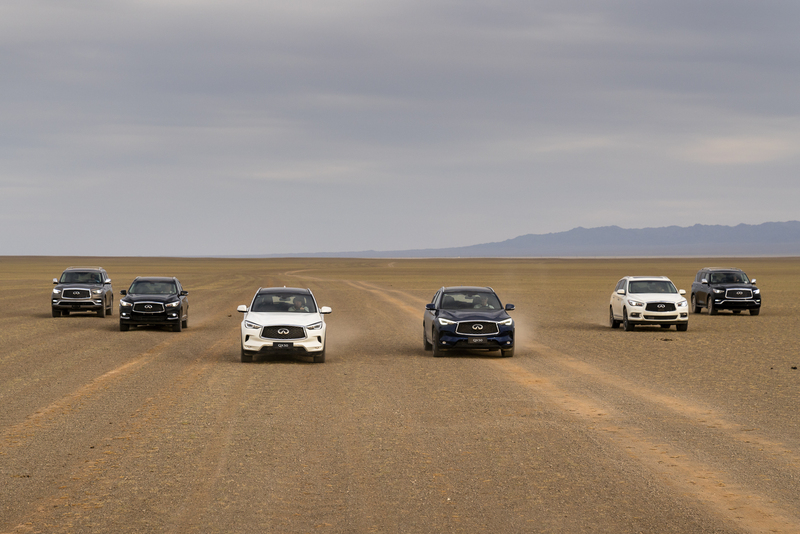 Even if not, the pace can be surprisingly brisk—sometimes hitting 60-plus miles per hour over scrubby terrain, vehicles yawing back and forth across the loose surface, demanding constant counter-steering. It’s the kind of overland adventuring that quickens the pulse. 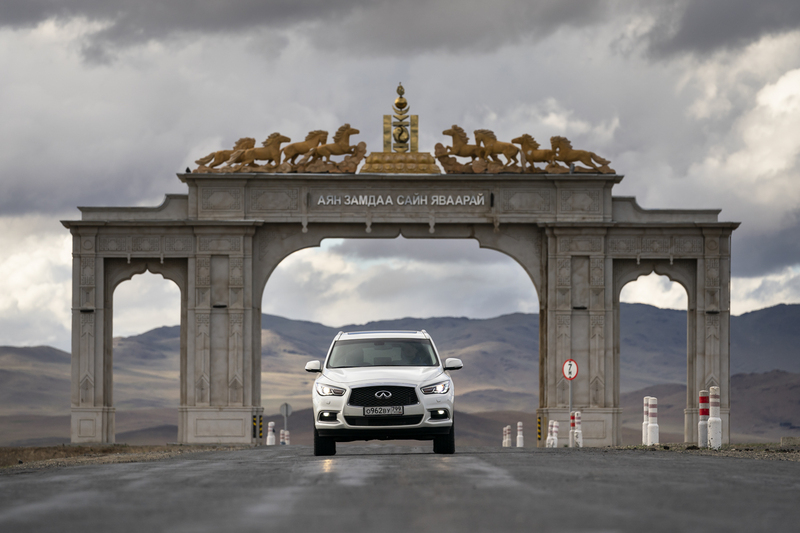 I knocked out about 40 miles of this hardscrabble travel recently, traveling with members of the Explorer’s Club Hong Kong Chapter and the Mongolian Institute of Paleontology and Geology aboard a combination of Nissan Navara pickups and Infiniti SUVs. 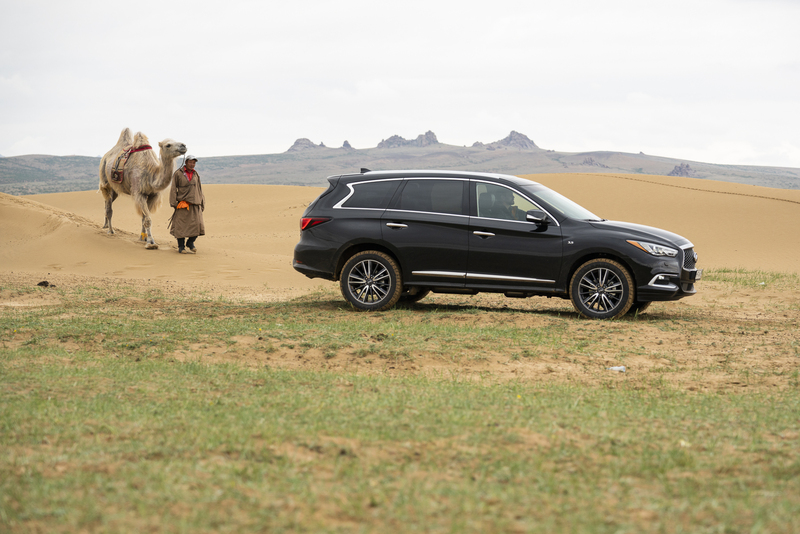 The former came from Nomadic Expeditions (experts in all things Mongolia), while Infiniti provided its vehicles as part of the brand's support of the mission I’d come to observe: a renewed search for fossilized dinosaur remains in a region of the Gobi first harvested by archaeologist and paleontologist Roy Chapman Andrews a century ago. Fossils were abundant back then—practically littering the ground, as Andrews recalled in his reports. (Fun fact: He was one of the inspirations for Indiana Jones.) But he loaded up his camels and Dodge trucks with tons of fragile remains and trundled them off for study; that was followed by a century of digging by other scientists, as well as plenty of illegal fossil poaching once the richness of Mongolia’s buried heritage became known. Nowadays, the search for dinosaurs and their prehistoric ilk is more complex. You have to look harder and dig deeper. 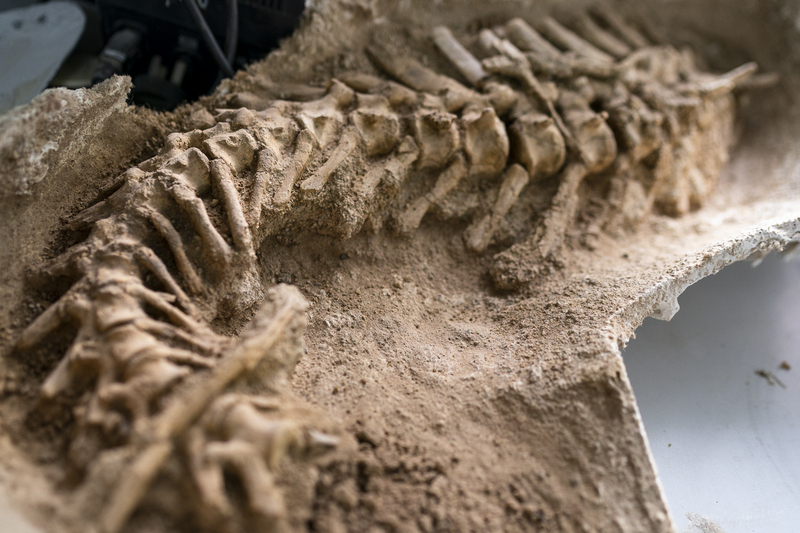 To aid in that conquest, paleontologists have turned to modern technology, including satellite data and, a bit closer to the surface, drone scanning. Spectral images from Landsat and ASTER satellites now provide big-picture starting points by isolating areas where fossils might be, based on the presence of sandstone, mudstone, and shale layers deposited during the Cretaceous era between 66 and 145 million years ago. Once they have those general areas targeted, drones equipped with thermal, spectral, and visible-light cameras can sweep in for higher-resolution scans that can narrow the area down for actual exploration. 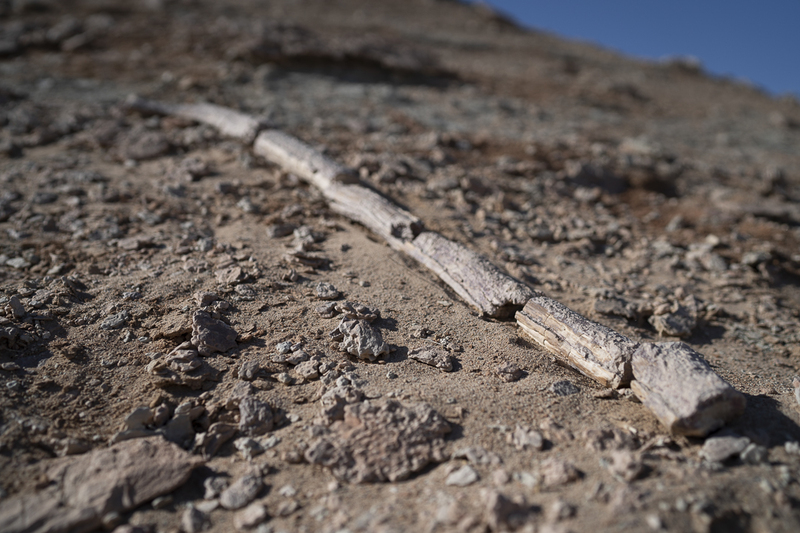 The team says the strategy has never been used before in this manner, describing the technique as a breakthrough in paleontological methodology. 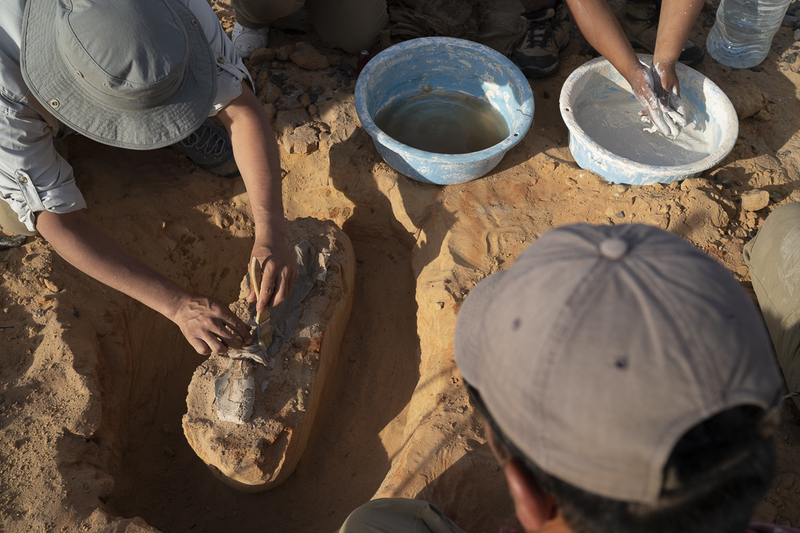 During the recent 20-day, 1,000-mile expedition across the Gobi, the team of 35 paleontologists, geologists, archaeologists, scientists, and Explorers Club members collaborated on gathering and acting on the new data. Thanks to the modified DJI Phantom quadcopter drones buzzing overhead, they found possible evidence of three new dinosaur species and more than 250 new fossil locations. Specific discoveries included the hind leg of an ostrich-like dinosaur from 65 million years ago, a 70-million-year-old intact turtle, and the neck vertebrae of an as-yet unknown species from the same period. 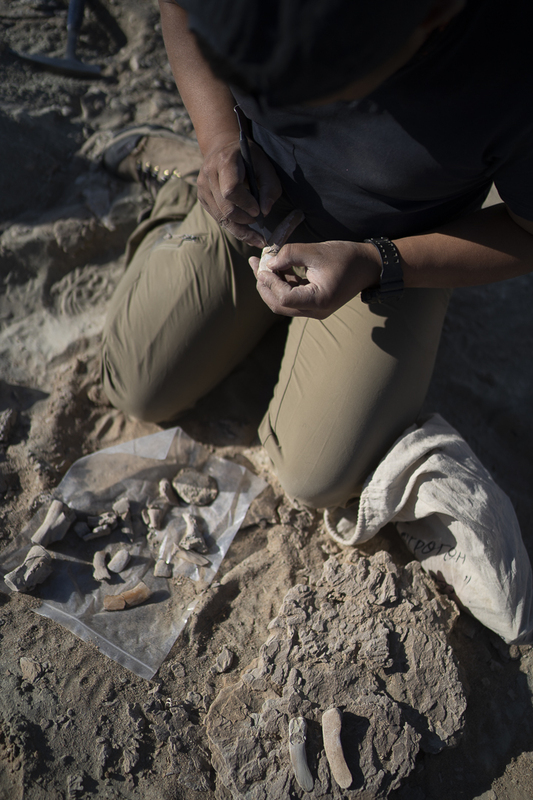 The expedition also reported uncovering the first fossil of a Velociraptor ancestor at a new site, a rare theropod egg, and the tail section, vertebrae, ribs, and skull fragments from a Tarbosaurus bataar, which is the Mongolian cousin of T. rex. 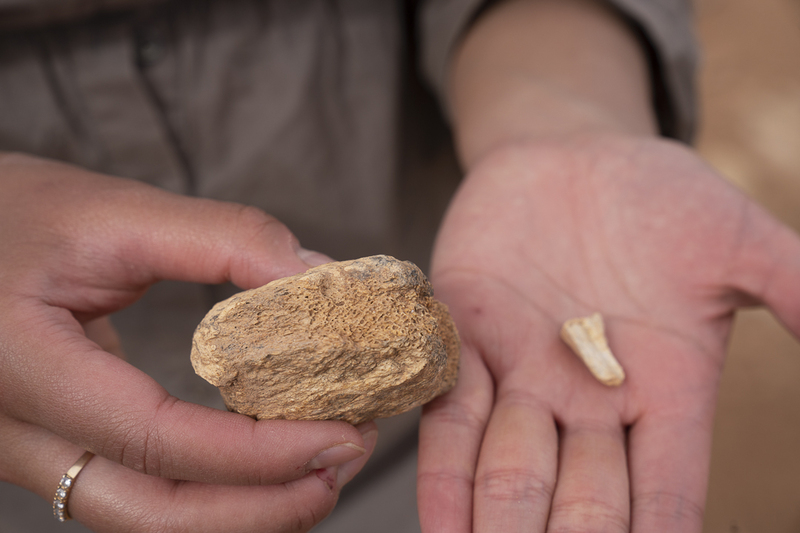 That particular find included a 10-centimeter-long (3.94-inch) Tarbosaurus tooth, suggesting that it could be the largest specimen yet found in Mongolia. 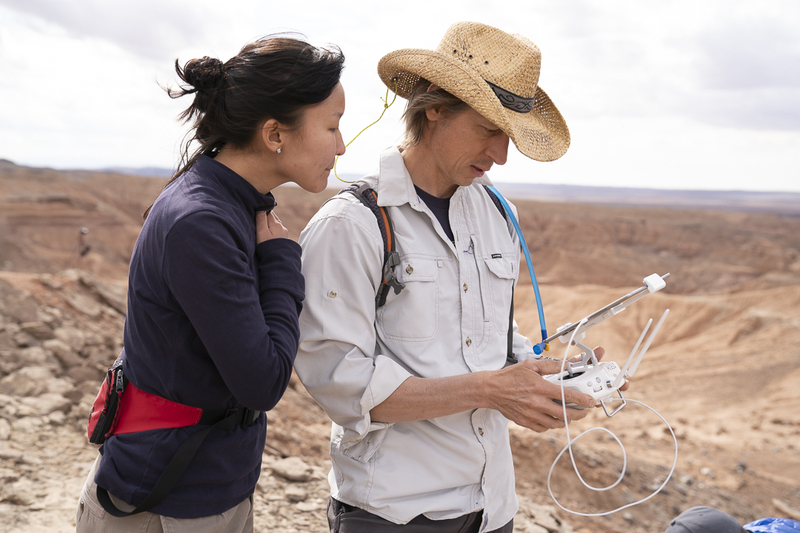 The team that executed the drone work, Quantum Spatial—its lead scientist, Scott Nowicki, worked on several Mars explorations with NASA—is still processing the data from the Gobi surveys, and the new sites will take years to fully explore and excavate. 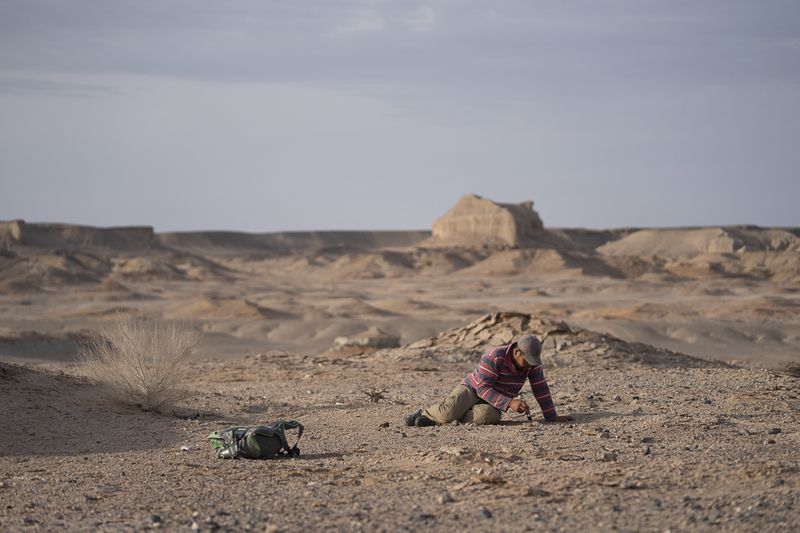 But the group isn’t wasting any time, and the recent effort included exploring some of those targeted areas in and around the Flaming Cliffs, a region that Andrews first explored during his 10-year expedition in the Gobi. It was there that he actually discovered the first dinosaur eggs to ever be found—a landmark discovery still lauded in paleontological circles. While the pros hunted at their sites, your humble amateur Indiana Jones of an author executed his own fossil search—coming up empty, of course. Aerial surveys can help isolate possible fossil sites, but actually finding the remains takes a sharp eye, and a steady hand with brush and chisel—both skills acquired through years of education and experience. 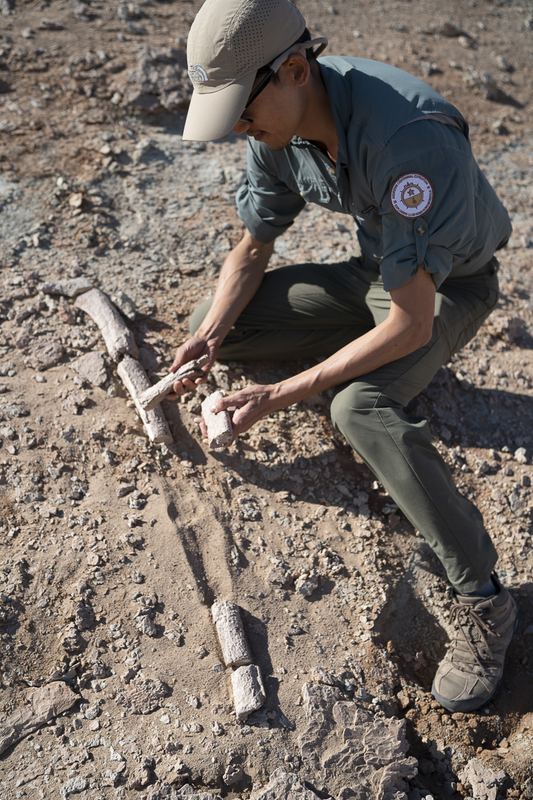 “You’re looking for protrusions that match the shape and color of animal bones, but it can be hard because the color and shape can blend in with the surrounding soil, and the remains can be fragmented,” Zorigt explained as we walked through a particularly promising canyon. Because of this, you have to be constantly “stitching” together possible fragments as you survey the terrain, paying close attention to vertical masses on the sides of hills, where erosion reveals its treasures the soonest. His team found numerous samples during our initial survey, but they’ll absolutely be back soon. “I’m very excited about this spot,” he said. “There’s a lot to explore here.” He adds that he fully expects the drone technology they’ve been using to itself evolve to the point where they can use them to find not just likely areas, but the fossil remains themselves, thanks to the high resolution and even the ability for computers to help scan the images. Because the fossilized remains are so fragile, even the slightest poke or unsteady hand can turn them to dust—making the entire expedition one painstaking extraction after another. The payoff can be immense, however, even if the species is already known. After completing the sweep through the valley, the paleontologists—and the wannabe Alan Grants helping out—packed it in for the day, heading back to the vehicles. 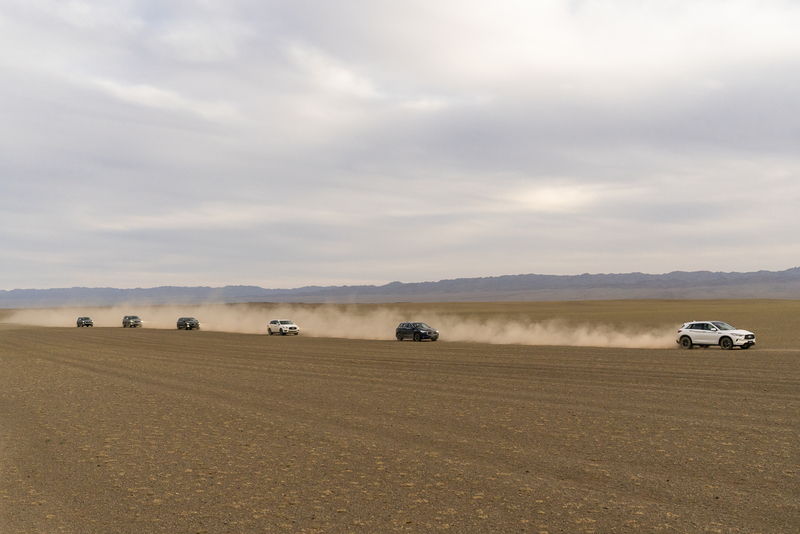 Though the terrain in the Gobi is much the same as it was when Andrews first explored it a century ago, it’s quite a bit easier to muscle through the wet spots and the vertical challenges now than it would have been back then. Andrews, an early member of the Explorer’s Club (and later, director of the American Museum of Natural History in New York City), was the first to use motorized vehicles on a dinosaur expedition; footage from the expedition shows the challenges as much as the benefits of the early cars and trucks he was forced to work with. Today’s vehicles, of course, make relatively quick work of the terrain. 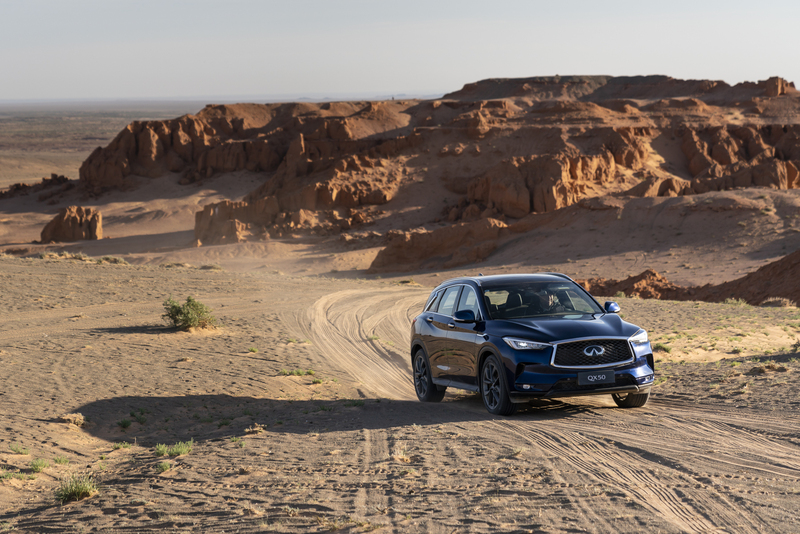 Even those designed primarily for the street—in this case, Infiniti’s QX50 and QX60 crossovers—could keep up the pace along 90 percent of the route, though they had to back off a hair sooner in the roughest spots, compared to the company’s more rugged QX80 and the Nissan pickups. Regardless, this new era of exploration benefits from all these new tools, from the drones overhead-mapping the terrain to generate more efficient searches, to the vehicles allowing the scientists to cover more far more ground than even the mobility-embracing Andrews could throughout his expedition. He’d presumably be thrilled with the results of all those technological advances.